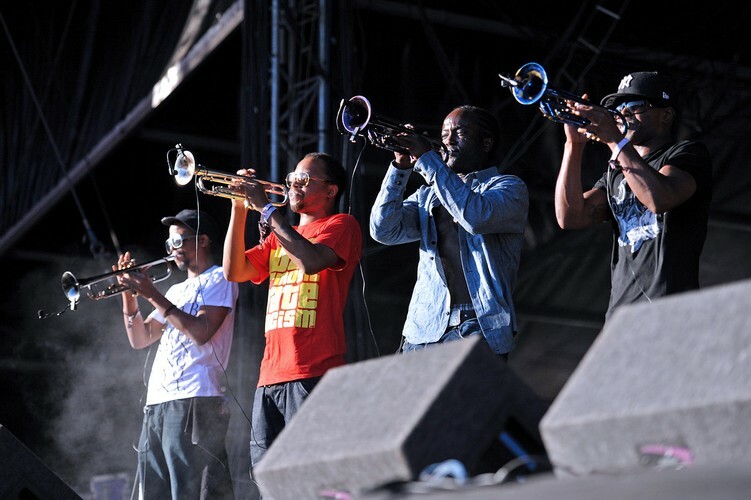 Hypnotic Brass Ensemble is a 9-piece, Chicago-based brass group featuring 8 sons of Phil Cohran on horns. Originally from Chicago, the brothers started as a street ensemble before recording in 2004. They have performed with Mos Def, Aquilla Sadalla, Phil Cohran, The Recipe, Nomadic Massive, Tony Allen and at the North Sea Jazz Festival. In late 2007 they recorded with Erykah Badu and Maxwell. They supported Blur for their Hyde Park reunion concerts on the 2nd and 3 July in 2009. They are also collaborators on a number of tracks from the third Gorillaz studio album, Plastic Beach.